On Thursday evening there will be a friendly match between Kosovo and Denmark. The 131st FIFA World Ranking meets the current 10th in the world ranking list. We would like to present you a form analysis for this interesting friendly meeting and then offer you a tip recommendation. Both teams will meet on Thursday at 19:00. The Kosovar national team can look back on a very successful year. They dominated their UEFA Nations League group and remained unbeaten in 6 duels. The current 131st FIFA World Ranking achieved victories over the Faroe Islands (2-0), Azerbaijan (4-0) and Malta (3: 1,0: 5). They only conceded 2 goals in 6 group games and scored a total of 15 goals, giving them a very good score of 2.5 goals per game played. The Kosovars also remained unbeaten in their friendlies and remained in their clashes against Madagascar (1-0), Burkina Faso (0-2) and Albania (0-3) without conceding. You can call them thus quite a strong home team. They contest their 1st compulsory game of the year against the World Cup finalists Denmark. The friendly will serve as a dress rehearsal for the opening match of the European Championship qualifier on Monday evening against Bulgaria. You also get to do it with Montenegro, Czech Republic and England. This is a really tough group and they will need a lot of luck to match the opposing teams. The total market value of the team is € 44.45 million and Milot Rashica has the highest market value of € 7.00 million. He brings it to 20 team missions and made for 2 team hits and prepared already 4 hits. Rashica is under contract with Bundesliga club Werder Bremen and has scored twice in each of the 20 matches this season. He is thus one of the key players and has a significant share of the current good 8th place Werderaner. Valon Berisha has a market value of € 7.50 million and is under contract with Lazio and has played 14 caps for his home country, scoring 1 goal. Arber Zeneli has scored 4 goals in his last 6 international appearances and is currently the most efficient striker in the 131st FIFA World Ranking list. Kosovo has been trained by Bernard Challandes since the beginning of March. The friendly match against Denmark is thus his opening match as a team coach. The World Cup participant is currently on the good 10th place in the FIFA World Ranking. The friendly international match acts for the Danes as a preparatory match for the European Championship qualification. Next Tuesday, the Danish national team will start their qualifying campaign against Switzerland. The remaining opponents in Group D are Ireland, Georgia and Gibraltar. These are truly feasible tasks and they undoubtedly are favorites for the group victory. In the course of the last calendar year, the Danes took part in the World Cup due to their successful qualification. They drew with two draws against Australia (1-1) and France (0-0) and a victory against the Peruvian national team in the second round. They had beaten the eventual vice-champion Croatia on penalties 4: 3. In the League of Nations, they have always been successful in their duels, securing wins against Wales (2: 0, 1: 2) and scoring twice against Ireland for a goalless draw. They thus deservedly took the 1st place of Group 4 in the league B. Denmark denied 6 friendlies during the last calendar year and decided the games against Panama (1: 0), Mexico (2: 0) and Austria (2: 0) in his favor. In their 4 away games, the 10th of the FIFA World Ranking reached 1 win, 2 draws and had to beat Slovakia 3-0. The total market value of the team amounts to 330.50 million €. Twenty-seven-year-old attacking midfielder Christian Eriksen scores the unbelievable € 85.00 million, the highest value of all players. He played 85 team missions over the course of his career, scoring 25 goals and preparing 19 goals. His playful qualities Eriksen also for his club, Tottenham Hotspurs, always proven. He scored 7 goals for the Premier League club this season in 38 appearances and prepared 12 goals. 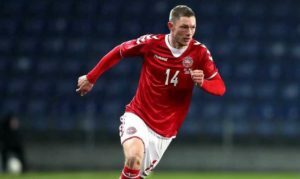 Denmark’s Jacob Bruun Larsen and RB Leipzig striker Yussuf Poulsen, who extended his contract until 2022, are also in Denmark’s squad. We see the Danish national team in the role of favorites for two reasons. On the one hand, they are much better placed in the FIFA world ranking list than in Kosovo. On the other hand, Denmark has a lot more players who are under contract with top European retailers and are consistently good week after week. Since our analysis has shown that Denmark is the big favorite, we would like to offer you our tip recommendation. Because of the also very promising odds for halftime 1 tip 2 and over 2.5 goals, we would like to recommend these odds as alternative tips.